The Italian construction sector accounts for 4.8% of the country´s GDP. The industry was severely affected by the economic downturn in recent years, with yearly GDP contractions between 2012-2014. Since the global credit crisis in 2008, Italian construction lost nearly 50% of production value and 69,000 employees due to the economic slump, decreased public spending, declined private investment and a profound credit crunch. However, not all businesses have been equally affected by the downturn. Most large construction companies have proved to be resilient due to their portfolio diversification of infrastructure works and export orientation. For example, in 2014 construction turnover generated by exports increased 9.7%, partly compensating for the slowdown of domestic turnover (down 6%). While this mainly benefited larger players, construction cooperatives and consortiums focused on the domestic market and dependent on public works have been severely hit by deteriorating demand and decreasing bank loans. Another major issue are late payments from public bodies, with an average payment duration of 177 days and unpaid bills amounting to EUR 8 billion in 2015. 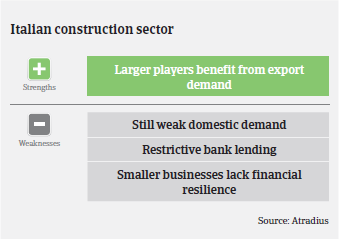 Small and medium-sized businesses focused on residential construction was the business segment most severely affected by the decline, due to decreased investment in private housing and restricted bank loans. The only exception was renovation works supported by government incentives. 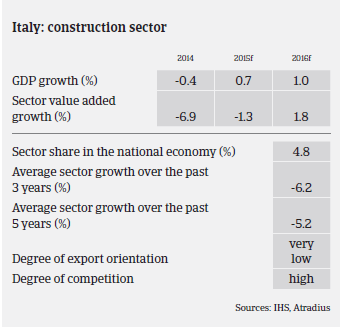 Since the end of 2014 deterioration in the Italian construction sector started to slow, as the economy rebounded modestly (GDP grew 0.7% in 2015). According to the Italian Statistics Institute ISTAT, contraction in construction production slowed down to 2.6% year-on-year in January-October 2015, after a 6.9% decline in January-October 2014. However, market indicators remain negative for investments in public housing and public infrastructure spending. In 2016 the Italian economy is forecast to grow 1%, and construction production is expected to decrease only 0.5%. Investments are expected to increase 3.2%, driven by public investments and by investments for extraordinary maintenance of existing buildings (up 1.5%), while investments in new housing is expected to decrease again (down 3%). Construction insolvencies still increased in 2015, among them three established building consortiums. Business failures are not expected to decrease substantially in 2016 and to remain on a historically high level – in contrast to the forecast for all Italian business insolvencies, which are expected to decrease 4% in 2016. Cooperatives and SMEs focused on domestic residential construction remain highly exposed to the risk of business failure. 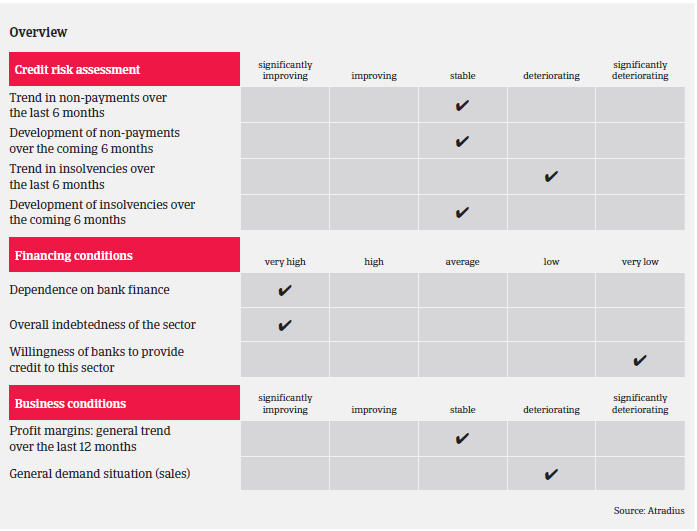 Trade payables and receivables days are expected to remain long, with no remarkable improvement in liquidity and in the payment performance of the industry. Therefore, our underwriting stance remains restrictive. It seems that the recession has bottomed out, but a profound recovery is not yet on the horizon. However, underwriting is more open for construction players who are export-oriented and less dependent on the domestic public sector. When underwriting construction businesses, we pay special attention to the quality of the credit portfolio, the order situation and the coverage with prepayments, the amount and maturity of debt, and the ability of cash flow to cover investments and service debt. Financial leverage has to be coherent with available liquidity and equity consistency. With more sensitive and large cases, there are meetings with buyers to get a better insight into their business and financial strategies.